Roses are the favored flowers for Valentine’s Day. They are spectacular flowers, wildly colorful and fabulously fragrant, yet very delicate. Few people know the secret to extending the bloom time of this magnificent flower. Once you know the steps to follow when working with roses then you will enjoy them for a week or more. When purchasing roses look for ones that have very tight buds that have not yet begun to open. Once you have them home place them in cool water. Cut the stems at a diagonal, under water. They should be cut at least 2” up from the bottom. The diagonal cut allows for more water absorption. If the floral supplier did not give you a packet of floral food to add to the water then add in a couple teaspoons of sugar. Remove the outside 3 petals from each flower. I am not certain why it is but this helps the flower to create a larger bloom. (For a romantic treat you can add these petals to a steaming bubble bath). Good luck HAPPY VALENTINE'S DAY! Happy New Year 2017 Fun Activities! Becky Dalke & Associates would like to wish everyone a happy and healthy 2017!! If a Move is in Your Future-Consider a Yard Sale! Getting ready to move? Perhaps thinking of downsizing and need to purge some household items? A Yard Sale is a great way to pare down and make a little money. The success of your yard sale will depend on proper planning and having a well thought out game plan. Here are some tips to consider when planning your Yard Sale. Contact your local government: Make sure you do not need a permit for your Yard Sale. In Shrewsbury, you do not need one however these rules vary by town. Contact your Neighbors: You can partner with a neighbor and make it a block event which can attract more customers. Plan Ahead: Starting about 6 weeks prior to your Yard Sale, go through each room of your home one by one and start clearing out the clutter. Separate items that are broken and not functional from those you can sell. As you move through your home place all items into like categories. Schedule your Sale: Set your time and start early. Advertise: Place an ad in your local paper with items that will be available. If you have big ticket items make sure you mention it. Additionally, advertise online at sights such as Craig’s List, YardSaleSearch.com or pay for an ad on Facebook targeting your town and area. On the evening prior hang all your signs. Use bright bold colors and make all your signs the same. Make sure you have checked with your local government for rules on where you can and cannot hang signs. Have Extra Bags on Hand: A few weeks prior to your sale stock up on all your grocery bags. Many bargain hunters will want to bag up the smaller items such as DVD, books. Etc. Set the Price: Make sure you have all items clearly marked with the price on a removable sticker. Many shoppers can be too shy to ask the price and may move on. Additionally, be open to barter, many seasoned bargain hunters will take the price as a suggestion and then barter. Do not be afraid to negotiate, remember your goal is to unload and make a little money. Make Change: Make sure you have plenty of small bills on hand and feel free to keep everything rounded to $0.25 so you only need quarters for small change. Many shoppers will come directly from an ATM which is only going to distribute twenties. Have a Power Cord on Hand: Selling electronics? Many shoppers will want to insure that the item works prior to purchasing, having an extension cord nearby will allow them to try it out. Have a Yard Walker: While you may be manning the cashier area have a friend walk around helping shopper find items, demonstrate how they work and assist them with getting heavier items into their vehicle. Many people find that decluttering is a great way to relieve stress by providing a sense of control and accomplishment not to mention gain a little extra space in your home. Why not make a little money in the process!!! With proper planning and preparation you can make the most out of your yard sale and earn a little extra spending money for fun summer activities ahead! Hometown Stats-Double Digit Increase in Home Sales for First Quarter 2016! Will you ever forget the winter of 2015? It was one that will go down in history as being one of the snowiest winters ever. We were blanketed with 120 inches of snow in Worcester,Massachusetts. That winter brought just about everyone and everything to a screeching halt during the months of February and March. Only the most motivated sellers were willing to put their homes on the market. By contrast,the winter of 2016 has been one of the mildest winters on record. That would explain the 14% increase in home sales in our local towns. Along with that, most towns have seen a slow but steady increase in home sale prices. As always, there were a few towns that did not follow thenorm from one year to the next. Shrewsbury’sinventory of homes between $300K - $450K was down by 60% in the first quarterof 2016. That lack of inventory createda 26% reduction in total homes sold in Q1 2016 compared to the same time framein 2015. 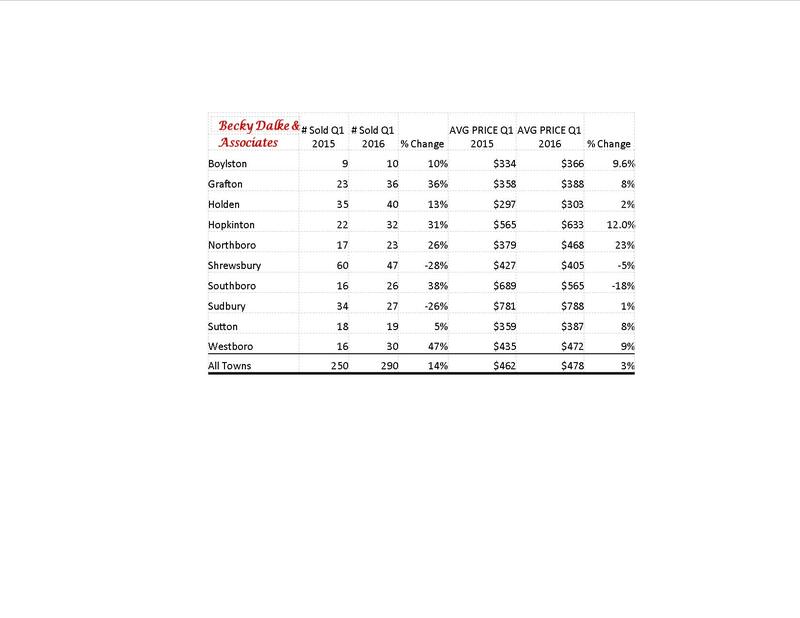 Southborough experienced an18% reduction in the average home sale price. This was due to an 80% increase of homes sold under $500k in Q1 2016compared to Q1 2015. This resulted in adecline in the median home sale price in Southborough from $675K in 205 to $517K in 2016. Sudbury’s home sales dropped by 26% in 2016. In Q1 2015 it took 111 days on averagebefore an offer was accepted on a home. That number dropped substantially in 2016 to 60 days to offer. This is indicative of high demand and lowsupply. With mortgage interest rates still hovering around 4%, we are anticipating a strong Spring market. If you are interested in selling your home or know of someone who is then please contact me. I would be happy to run a confidential market analysis to let you know the value of your home in today’s market and discuss a customized marketing plan designed specifically for your home.